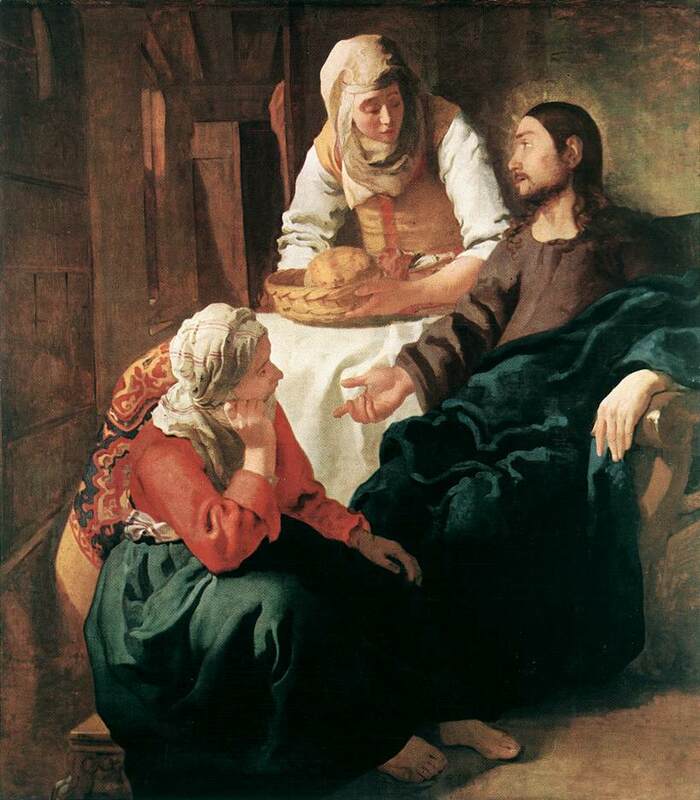 Christ cured St. Peter’s mother-in-law of her fever. But He did not do it simply so that she could get up and serve Him a cup of cool water and a falafel sandwich. The Pope, Oberon, Titania, etc. Thank goodness, the bar’s so refreshing. Last week our Holy Father spoke to the German parliament. Positivist reason which recognizes nothing beyond mere functionality resembles a concrete bunker with no windows, being no longer willing to obtain light and air from God’s wide world…The windows must be flung open again; we must see the wide world, the sky and the earth once more and learn to make proper use of all this…The ecological movement realized that something is wrong in our relationship with nature, that matter is not just raw material for us to shape at will, but that the earth has a dignity of it own and that we must follow its directives. The importance of ecology is no longer disputed…Yet I would like to underline a point that seems to me to be neglected, today as in the past: there is also an ecology of man. Man too has a nature that he must respect and that he cannot manipulate at will…Man does not create himself. At this point in the Pope’s speech, the Parliament burst into applause. …Pass the Rebel Yell, please. This evening, I intend to suspend my ferocious contempt of ACC football and root like mad for the HOKIES!!! When you ride the Seventh Avenue-Broadway IRT on the Upper West Side in Manhattan, you roll through the ghost of the 91st Street Station. The train doesn’t stop, because the station has been closed since 1959. When you pray your way through the Easter season according to the Roman Missal–in most ecclesiastical provinces–you roll through the Seventh Sunday of Easter like a ghost station. Because now this Sunday is the perpetual home of the Solemnity of the Ascension, transferred from Thursday. The liturgy train doesn’t stop on the pages of the Lectionary marked “Seventh Sunday of Easter” anymore. The gospel reading for the Seventh Sunday of Easter is the priestly prayer of Jesus. I certainly am not competent to judge great things, like how to make decisions about when people have to go to Mass. But this situation is rather ironic. The treasures of the bible are to be opened up more lavishly, so that richer fare may be provided for the faithful at the table of God’s word. In this way a more representative portion of the holy scriptures will be read to the people in the course of a prescribed number of years. 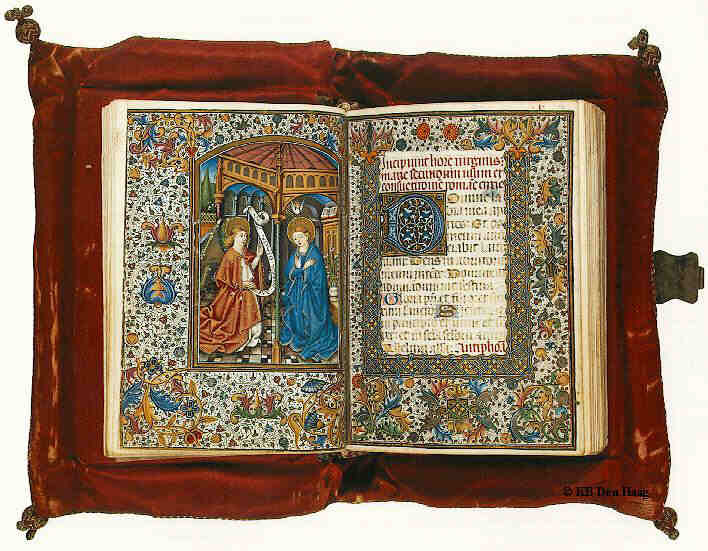 And yet, because going to Mass on a Thursday is too inconvient for people, we solemnly read the Prayer of the Hour of Jesus–by any estimation, one of the most important texts of Scripture, upon which the entire spiritual life of the Church is based–we read it in church…never. You would have a fine point. I would grant your penetrating pertinacity. Praise God. You cheered me up. But, nonetheless, it would be edifying, don’t you think, to hear the original version of the Eucharistic Prayer read from the holy book, at least every once in a while. 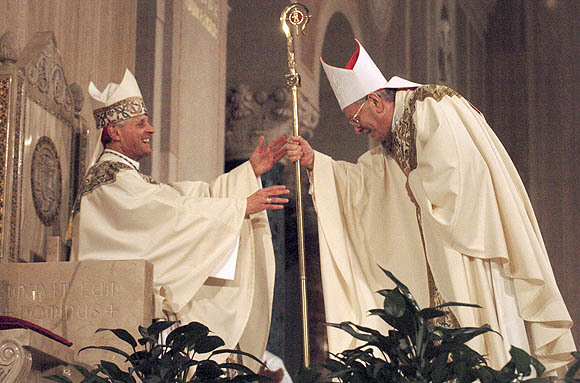 Three years ago today, Donald Wuerl took the crozier in hand to guide the Archdiocese of Washington. Christ the Lord, Son of the living God, came that He might save His people from their sins and that all men might be sanctified. Just as He Himself was sent by the Father, so He also sent His Apostles. Therefore, He sanctified them, conferring on them the Holy Spirit, so that they also might glorify the Father upon earth and save men, “to the building up of the body of Christ” (Eph. 4:12), which is the Church. The bishops…, having been appointed by the Holy Spirit, are successors of the Apostles as pastors of souls. Together with the supreme pontiff and under his authority they are sent to continue throughout the ages the work of Christ, the eternal pastor. Christ gave the Apostles and their successors the command and the power to teach all nations, to hallow men in the truth, and to feed them. May the good Lord prosper the endeavors of our father and shepherd, Archbishop Wuerl. …Want to learn more about the Bible? Are you within striking distance of Upper Marlboro, Maryland, U.S.A.? Come to Scripture Study this evening at St. Mary of the Assumption School, starting at 7:30 p.m.! I am not trying to criticize anyone. But, back when I was a layman, I heard a lot of lame homilies on Trinity Sunday. Who knows? Perhaps by the time we are done here, you will be saying the same thing. The thing that annoyed me was when the preacher would begin his Trinity Sunday homily by saying something like: “The Trinity is such a mind-boggling, impossible mystery, I simply cannot begin to explain it.” Then he tells you the story about St. Augustine trying to write a book about the Trinity, and the little boy by the sea, and putting all the ocean into one little hole, etc. Okay, okay—we get it. The Trinity is a mystery which surpasses our understanding. The reason this annoyed me is: The best possible explanation of the mystery of the Holy Trinity is right in front of our noses. The Mass explains the Holy Trinity perfectly. The Holy Trinity is not abstruse, not remote, not unfamiliar. There is, in fact, nothing more familiar than the Trinity for people who go to Mass. Let me explain. When I first started out in training for the priesthood, I worked in a parish helping to take care of the elderly people in the neighborhood. There was an old car for me to use to take the ladies to their doctors’ appointments. Perhaps you, dear reader, are aware that the Sovereign Pontiff Benedict XVI has restored to all Catholic priests the option of keeping the old-time Catholic religion alive. I.e. : Mass in Latin. The priest facing east, the same direction as everyone else. The priest praying the ancient prayers and making the gestures of supplication to God that were faithfully done for centuries–until things were simplified, updated, and revised around 1970. Anyway, I am definitely not one of those priests who thinks that the new Mass—with English readings and prayers—is a bad idea. Most priests–even us rigid young ones–think that having the readings in English is a good idea. I very much like to say Mass the way I originally learned it six years ago from my beloved teacher, Fr. 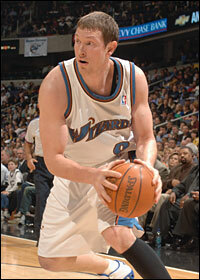 Stephen Nash (who is now a monk called Daniel at a monastery in Austria). I will say this, though: There are some things about the Old Mass which make it more prayerful. To me, it makes more sense for the priest to face God when he is praying and not face the people. Praying to God and looking at the people at the time is one of the most ridiculous things I can imagine. There are moments during Mass when the priest speaks to the people; he should look at them then. But when the priest is praying, it makes sense for him to face the same way as the people–that is, toward the Lord. The old Mass also makes it much clearer that the Mass is a sacrifice. In the Mass, the priest and the people together offer the Son of God to the Almighty Father for the salvation of the whole world. It is the only sacrifice that actually works. The human race has tried just about everything else: chickens, heifers, people…none have done any good. But the Precious Blood of Christ offered to the Almighty Father on the altar actually does bring about the forgiveness of sins and fills the world with grace. 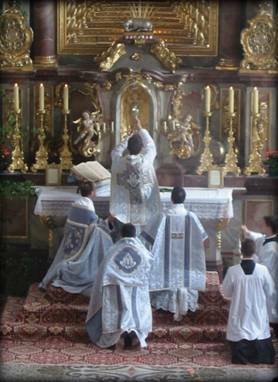 If it is not a sacrifice, it is not the Holy Mass. The new way of saying Mass sometimes seems like an occasion for teaching and singing, but not a sacrifice (even though it is one). 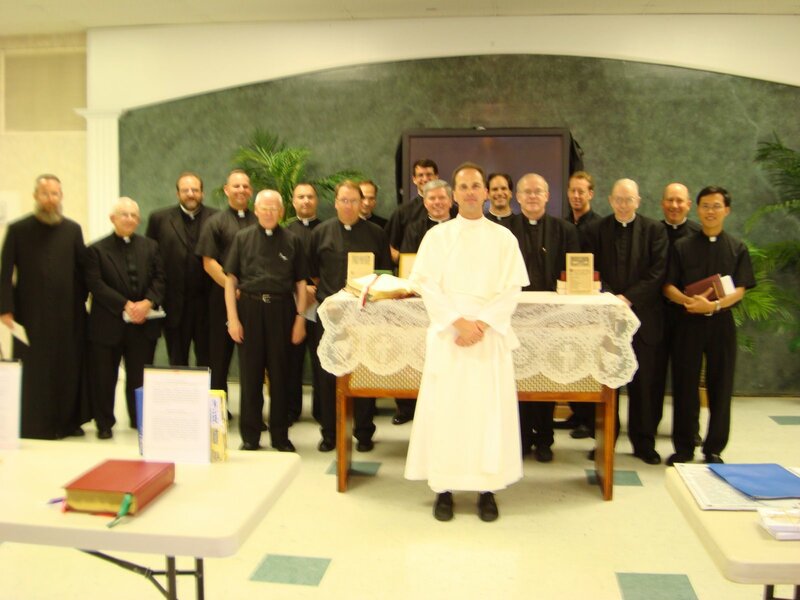 A priest should try to be a good teacher and leader, but first and foremost he is a man who offers sacrifice to God. The old way of saying Mass makes this much clearer to everyone, especially the priest himself. I must admit that I have found it rather difficult to learn how to say Mass the old way–but I am getting there. I had better be getting there, since I am celebrating the Solemn High Tridentine Mass at 5:00 p.m. this Sunday (at St. Mary Mother of God parish on 5th St., N.W.) May it be for the greater glory of God and the salvation of souls!